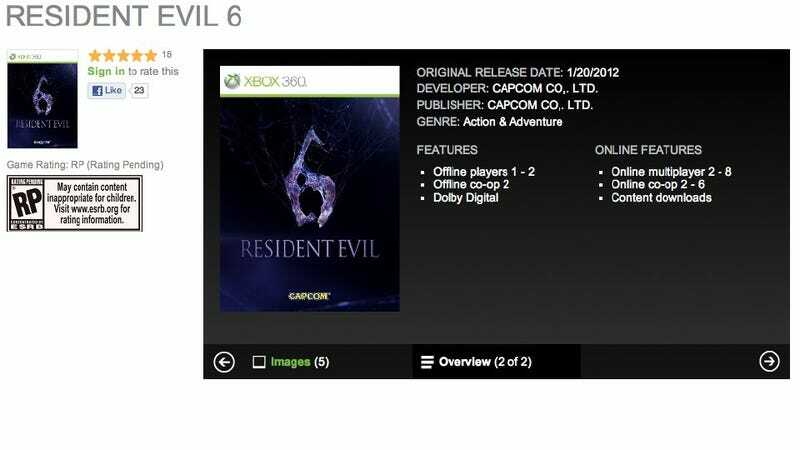 Resident Evil 6 to Feature Six-Player Co-Op? With Resident Evil 6 confirmed, Xbox.com has tossed up a product listing. Among the details we haven't yet heard: the game will feature six-player online co-operative play. Co-operative play of that size would be a first for Resident Evil, and might be a play on the game's series number. Who knows. Resident Evil: Operation Raccoon City will feature four-player co-op when it arrives (in North America and Europe) in March. Resident Evil 5, which released in 2009, had two-player co-op. The Xbox.com listing gives an erroneous release date, but that may be the date the listing was added to the system. The game is confirmed for a Nov. 20 release. I've emailed Capcom representatives to point out the listing and give them a chance to correct or confirm it.